﻿ Centre Hotel, Da Nang | FROM $27 - SAVE ON AGODA! "Good location , biggest room ." Have a question for Centre Hotel? "Friendly staff, walking distance to dragon bridge." "Staffs are accommodating and friendly." "We really enjoyed our stay at centre hotel, which was equipped with great facilities and exceptional service that exceeded our expectations." 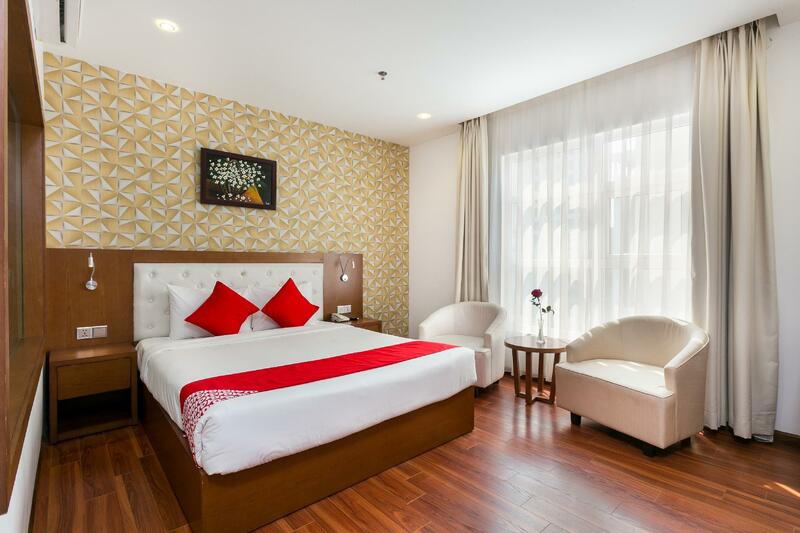 "The staff were lovely and helpful and you could walk to most..."
Nestled in the heart of Hai Chau, Centre Hotel is an ideal spot from which to discover Da Nang. The hotel lies 0.1 km from the city center and provides accessibility to important town facilities. With its convenient location, the hotel offers easy access to the city's must-see destinations. Offering hotel guests superior services and a broad range of amenities, Centre Hotel is committed to ensuring that your stay is as comfortable as possible. Top features of the hotel include 24-hour room service, free Wi-Fi in all rooms, 24-hour security, daily housekeeping, gift/souvenir shop. 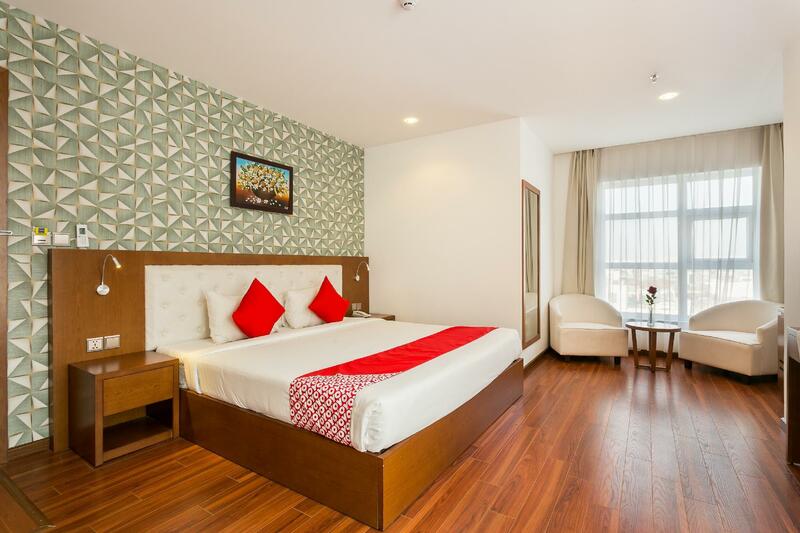 84 rooms spread over 8 floors provide a warm and pleasant home away from home. Modern comforts such as television LCD/plasma screen, complimentary instant coffee, complimentary tea, locker, mirror can be found in selected rooms. The hotel offers many unique recreational opportunities such as hot tub, karaoke. 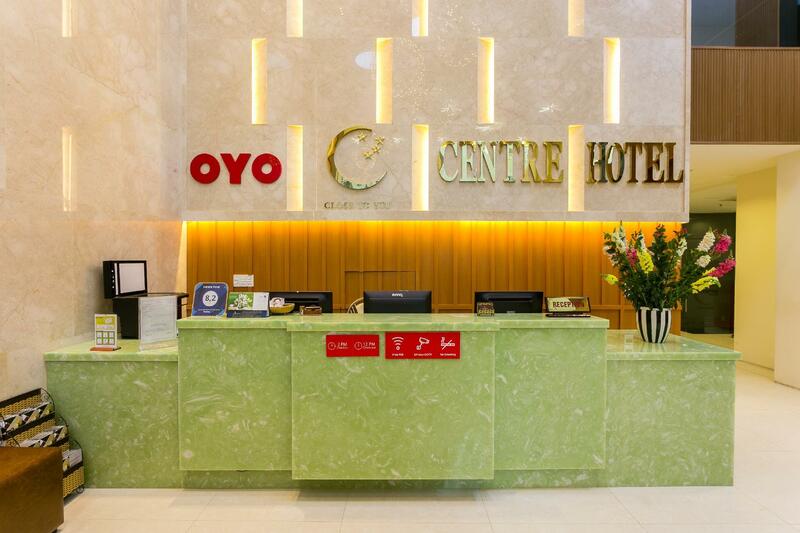 Discover an engaging blend of professional service and a wide array of features at Centre Hotel. "Staffs were very friendly and well-mannered." The hotel is at a good location and the staff - special mention to Ha, she was great - very helpful, friendly and no issues is ever too hard for her to sort out. She made our stay at the hotel very comfortable and hassle free. Hotel is very clean and really like the adjoining rooms separated by a sitting room. However the furniture in the sitting room was old and needs replacing. Locate near the river a block from the Catholic Cathedral this was a very convenient hotel for our first night in Vietnam. The staff was very professional and welcoming, especially Vo Thi Cam Ha. The breakfast was superb. Really nice hotel with great facilities, close to the river and bridge, staff were extremely helpful, room really good sized. I arrived early and ensured that I had the room even though early. Organised a tour to Hue reasonably prised. Would recommend the hotel. Specially thank you Guest Relation Officer, Cam Ha. Ha is very caring us in every morning, she can remember each customers flavours, and very sweet give advice to adjust our schedule which place go first is better. Ha is a wonderful staff in Centre hotel. Other receptionist staff and bellboys are very friendly and helpful also. The hotel breakfast taste good, many Vietnamese foods that you can eat here. 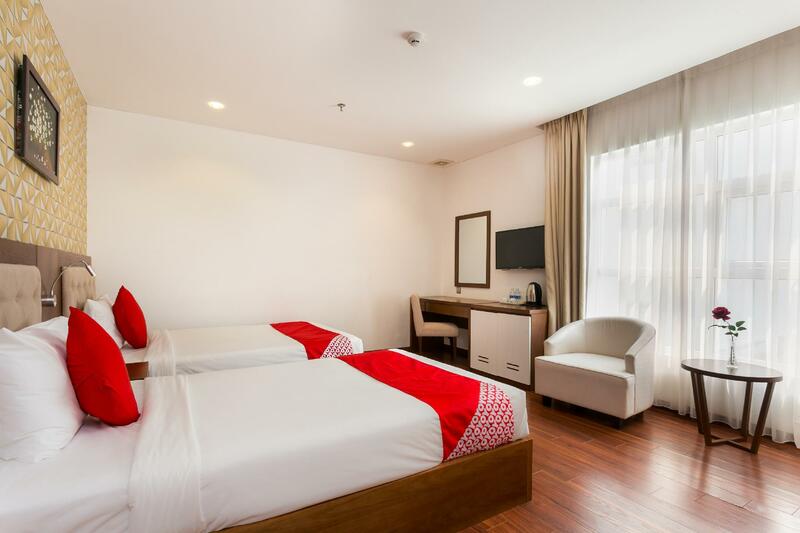 The location of Centre hotel is very good, very closed to pink church, Hon market, have many restaurants and coffee shop are nearby, around 5-10 minutes can arrive. The night view of Da Nang is good, can see dragon bridge, 5 minutes can arrive from the hotel. Hi Lok, thank you so much for spending time with us and sharing your wonderful words with everyone. We're happy to know that you enjoyed the service of our staff, our location and breakfast. Cam Ha would be delighted to read your review and we will make sure she has the chance to read it. We'd love to welcome you back to Centre Hotel as soon as possible. Hi Aira, thank you so much for staying with us and taking the time to share your review. We're glad to know that you had a comfortable experience at Centre Hotel. Your comments regarding our staff service, location and breakfast are much apprecited and we look forward to seeing you again. Until then, please have a nice day! This is a simple budget hotel, what makes it outstanding is the staff, especially Tran, Ha, Lan and the bell boy whose name I didnt get to know. Very dedicated and dependable staff indeed who responded to our ground travel and accomodation needs promptly. I would like to express my gratitude to them again, keep up the good work ! Hi Paul, thank you so much for your stay and kind mentioning of our staff. We're happy to know that you enjoyed our hospitality and service. It was our pleasure serving you and we definitely look forward to your next visit. Until then, please have a nice day! This hotel is become my permanent destination for weekend holidays, nicely located all attraction are nearby only. 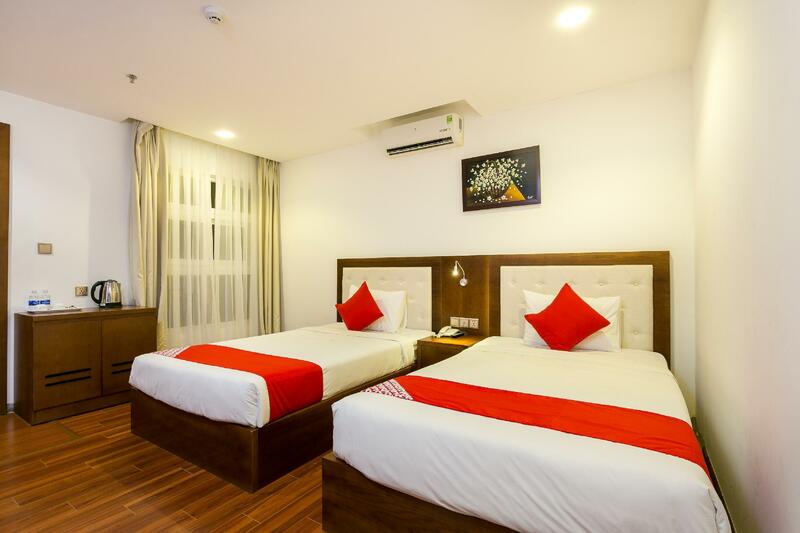 hotel facility is brand new, all bath rooms have bath tub and superb hospitality with big range of breakfast for the guest. Hi Vimalkumar, thank you so much for your stay and fantastic review. There is nothing more rewarding for us than hearing you say that we've become your permanent destination. Your comments regarding our location, facilities, breakfast and hospitality are much appreciated and we're happy to know that you enjoyed your time at Centre Hotel. We just can't wait to see you again and spend more time with you in the near future. All the best. This is my third time stay in this hotel it Is newly renovated with all new facilities and value for money. 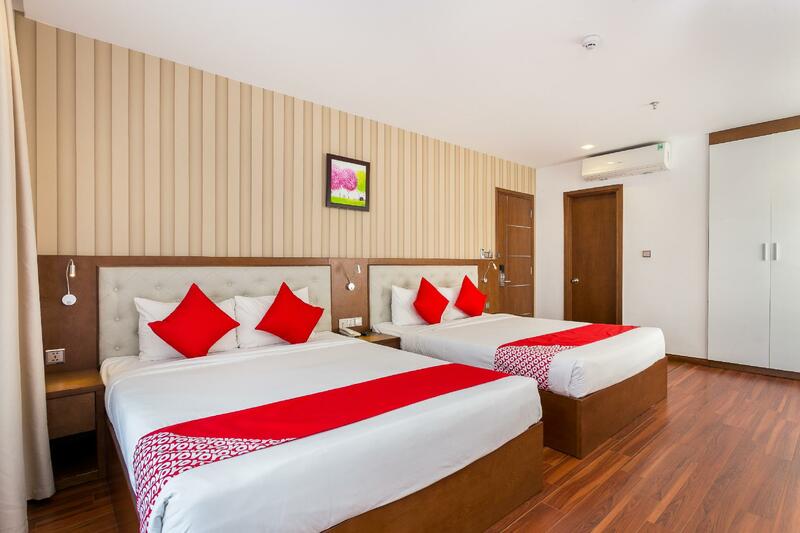 Big room, all rooms have window and bathroom with bath tubs large bathroom. Surrounding area is very good. Market is just few steps away and beautiful view of river in night. 8th floor restaurant in large area with open terrace with guards giving relaxing feeling and fantastic view of bridge and riever. I strongly recommend to stay in this hotel and enjoy experience of great service. Hotel staff Ms. Thao in reception and Ms. Ha in restaurant is very cooperative staff and taking care of your every needs. Hi Vimalkumar, thank you so much for staying with us again and taking the time to review our property. Your comments regarding our location, facilities and services are much appreciated. We're happy to know that you enjoyed your third time at Centre Hotel and would love to share the beautiful fourth time with you in the near future. Ms. Ha, Ms. Thao and all of us are waiting for your next visit. Until then, please have a nice day! this is second time i stayed in this hotel, nicely located in front of River. staff are very good, perticulary Ms. Ha at restourent very helpful and so kind tacking care of every need of guest in breakfast, as i am vegiterian she arrange veg nuddle as per request. the hotel is newly renovated and very good. All rooms have windows. 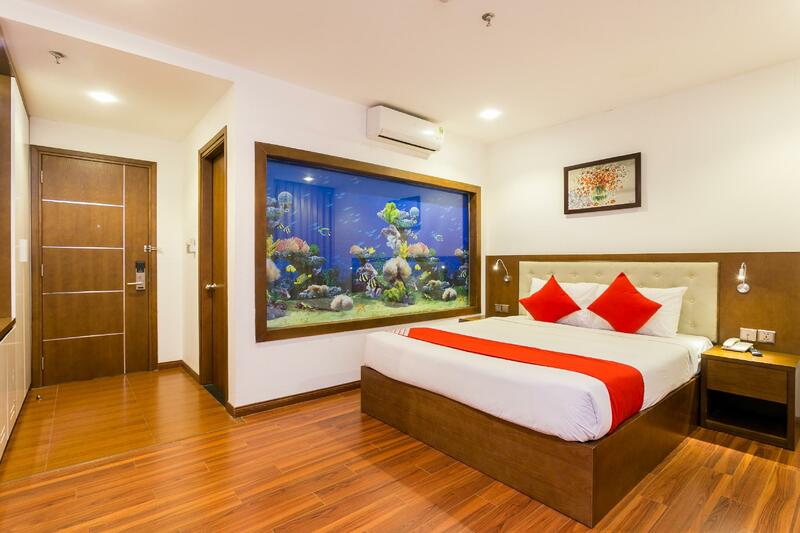 i strongly recommended this property for your comfortable stay with family. Hi there Vimalkumar, it is such a pleasure hosting you again at Centre Hotel. We're glad to see you returned and enjoyed your stay. Your satisfaction is the best motivation for us. Thank you for all the nice words about our facilities and services, they're much appreciated. We look forward to many more greater experiences with you in the near future. Best wishes! Very friendly and helpful front desk staffs, very good location. Breakfast can be better. Living up to its name, Centre hotel’s central location provided us with easy access to many attractions. We really enjoyed our stay at centre hotel, which was equipped with great facilities and exceptional service that exceeded our expectations. We especially loved Ha, who went the extra mile to make conversations with us and made sure that we were comfortable during our stay. She was always ready to answer our queries and provide information which aided us in our travels around Danang. Hi Amanda, thank you so much for staying with us and taking the time to share your thoughts about it. We're happy to know that the quality of your stay exceeded your expectations. Ha would be delighted to hear that her support has aided in your travels around Da Nang, she loves taking care of guests. Once again, thank you for sharing your comments with us, we look forward to seeing you again. when I arrived at Danang airport, they came to pick me up on time, If you want to use that service, just ask them. and the staffs are mostly kind and helpful. the location is perfect to travelers. i want to stay there if i go Danang again. thanx. Hi Heesuk, thank you very much for your stay and positive review. We're pleased to know that you was satisfied with our hospitality and service and would like to stay with us if you travel to Da Nang again. Your satisfaction is our greatest motivation and we do look forward to seeing you again as soon as possible. Hello Max, thank you for your stay and candid review. We're sorry your experience did not meet your expectations. As a newbie in hospitality industry, we strive to learn and do better everyday. So your feedback has been well noted and passed to appropriate departments for further improvements. And we'd really appreciate any other suggestion or recommendation from you as to how we can improve to serve you and other guests better. Hope to have another chance to show you our new and better appearance. Kind regards. It's difficult to find anything negative about the Centre Hotel. 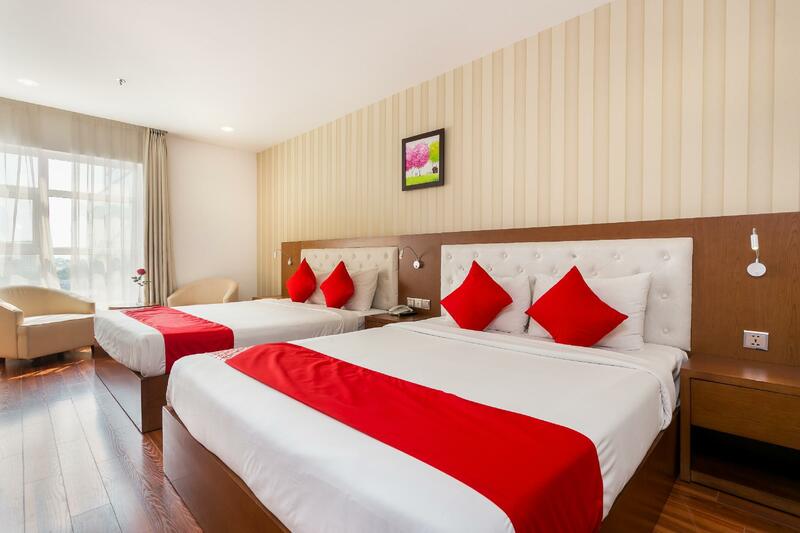 The location is excellent, the rooms are modern and clean and some of the top rated restaurants in Danang are within walking distance. What makes this hotel a truly outstanding place to stay is the staff. They are friendly, helpful and always smiling. I fell in love with them. The front desk booked us a tour to Sun World and the newly opened Golden Bridge. I was a little concerned at first was the price was less than half of what other tours charge and the others had less than stunning reviews. We had an excellent tour with guide, a buffet lunch and spectacular views. You are in for a special treat when you show up for the breakfast buffet that is included with your room! Coffee, juice, fruit, soup station, eggs cooked to order and an incredible selection of Vietnamese, Asian and Western dishes updated daily. There's something for everyone. And once again, the staff was incredible! Enjoy and don't eat too much!!! Hotel provide a very good service especially a staff name Ha can speak very good english and polite. Food nice. Room clean. Front counter also help to book the car and is cheaper. Hotel nearby have a lot restauran and cafe. Hi Koay, Thank you so much for sharing your review with us. We are so thrilled to read of your enjoyable stay, especially with our location, staff and service. Your satisfaction and your rating are an encouragement to us in the pursuit of making each stay a memorable one. We wish you a lifetime of happiness and we all look forward to welcoming you again soon to Centre Hotel. Have a nice day, Centre Hotel Team. Location is very near to fascination such as Hans market, cathedral. Few hundred metres to CAO Rong dragon bridge. A lot of restaurant and coffee shop nearby. If u have a group of person, worthwhile to book a van to Hai van pass, langco beach, son tra, my khea beach. (half day tour). U can also book a van to bana hill. Reception and waitress at restaurant is very polite, warm and good services, they stand up and greet u every times u pass by. Breakfast is average and change little bit everyday but sufficient to let u start for a day. 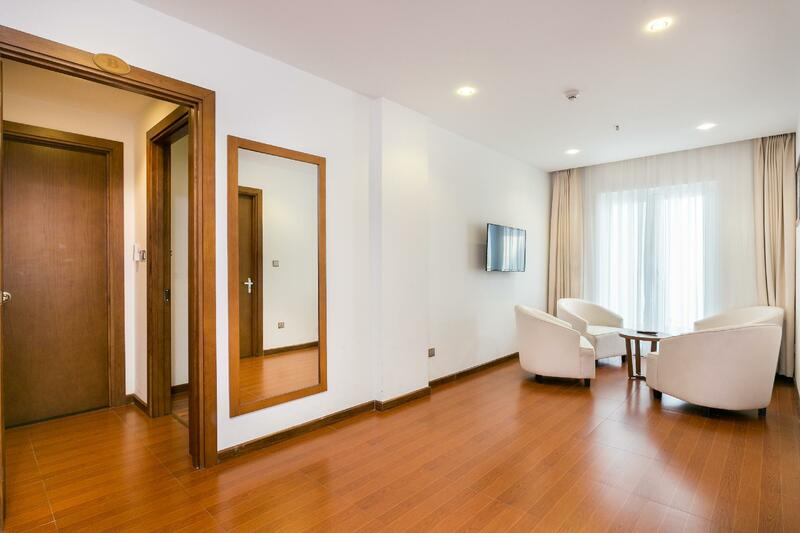 Clean and newly renovated corridor and room. If u just need a place to stay and not looking for luxury hotel, centre hotel is definitely a good one! Friendly staffs.Hotel room is clean.Great choice if want to shop at Han Market, hotel just next to it. I arrived by night flight and stayed overnight. I kept my baggage and watched the market and the surrounding area.